Jason Swiger, 24, was a 2000 graduate of South Portland High School who found his calling when he joined the Army, said South Portland High School principal Jeanne Crocker, who said she was told that Swiger was killed in Iraq. Swiger's death is all the more difficult not only because of the way he died but because of his young age, Monsignor Paul Stefanko said during an hour-long Mass. “He will be remembered as a man of his word. As a man who stood up for what he believed in. As one who was willing to fight for those beliefs and values,'' Stefanko said. ``As a man who was proud to be serving in the military." 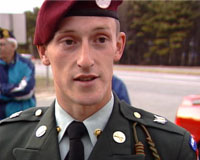 Swiger was assigned to the 5th Squadron, 73rd Cavalry Regiment, 3rd Brigade Combat Team, 82nd Airborne Division, Fort Bragg, N.C. and was killed by a suicide bomber while handing out candy to Iraqi children.